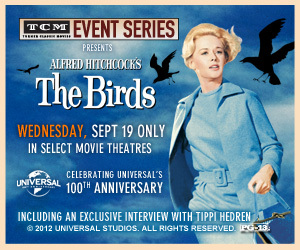 The Lady Eve's Reel Life: Ticket Giveaway: "The Birds" is Coming! 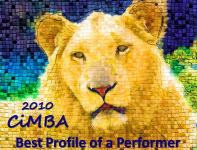 Please send your entry, including your name, mailing address (no P.O. boxes, please), and theater selection (I need all three) to ladyevesidwich@gmail.com. The winner will be contacted immediately and tickets will be sent directly from a representative of NCM Fathom. Click here for a list of participating theaters. Update: On Sept. 16, a winner was selected by random drawing - congratulations to Rebecca in Indiana (and thanks to everyone else who entered the drawing)! This presentation of Hitchcock's 1963 classic thriller, Oscar-nominated for its special effects, will screen at 7pm local time. Special features include an introduction by TCM's Robert Osborne as well as his interview with the film's leading lady, Tippi Hedren. Co-stars Rod Taylor and Suzanne Pleshette will also share on-the-set stories via archival TCM footage. The film itself has been newly restored by Universal in celebration of its 100th anniversary. So terrific of you to offer this! We "Bird-brains" are waiting with bated breath and crossed beaks to find out who wins! Ken, I have a feeling this is going to be a very popular event and only wish I had a pair of tix for everyone who enters the drawing. Just send me your info, Becky, and your name is in the hat - with my good luck wishes!